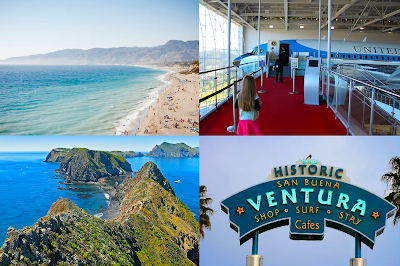 Ever wondered what tourists want to see in Ventura County? As a provider of limousines for tourists and locals alike, we often transfer international vacationers in the region. Many call for an LAX pickup for a destination in VC. You may be surprised of how much there is it to see in our beautiful county! From beaches, forests, deserts and mountains, it truly is an activity for anyone in our diverse and stunningly scenic county. Museum of Ventura County, Chumash Indian Museum, Gardens of the World, Camarillo Ranch House and Satwiwa are all beloved destinations for our limos. A recent trend has also been chauffeured rides to Stagecoach Inn, an 1876 museum located in the Newbury Park section of Thousand Oaks, CA. Here visitors come to experience the old Conejo Valley. Some attractions include the 1889 Timber School, a reconstructed Chumash Indian village, as well as historic artifacts from European pioneers and Native-American tribes. This 250-acre archipelago, which is part of the larger California Channel Islands, is a U.S. National Park which receives over 350,000 annual visitors. These undeveloped islands will give the traveler the unique feeling of experiencing how SoCal once were. Untouched wilderness, multitudes of wildlife, pristine beaches and unmatched scuba-diving awaits on Santa Cruz Island and other nearby islands and islets. We have numerous times had clients loading their camping gear in our limos for a trip to Ventura- or Oxnard Harbors, where ferries daily depart for the islands. Pristine stretches of sand can be found throughout the coastline, e.g. in cities as Port Hueneme and Oxnard. Popular ones include Silver Strand Beach in Oxnard and Ormond Beach in Port Hueneme. The City of Ventura is home to most VC beaches. This is where we find beloved treasures as Emma Wood, San Buenaventura and Solimar. For the overnight tent camper, check out Faria Beach or the even prettier Thornhill Broome Beach. It may be to no one’s surprise, but Thousand Oaks’ largest shopping mall is an incredibly desired limo stop. Here clients come to dine, shop, go for a movie, and even for a drink. This 1,3 mi. square feet shopping center has nearly 200 shops and is one of the region’s largest. The mall is annually visited by over five million shoppers, and is easily accessible from the 101, conveniently situated in-between Los Angeles and Santa Barbara. SEE ALSO: 5 Things You Do Not Know About Thousand Oaks! With more than half a million visitors per year, Ronald Reagan Presidential Library and Museum is a must for anyone visiting Simi Valley, Thousand Oaks, and nearby areas. Besides an actual indoor Air Force One, a presidential plane used during various administrations, the museum also features a replica of the Oval Office as well as replicas of Washington’s South Lawn and Rose Garden. An over 6,000 lbs part of the Berlin Wall is also a must, not to forget the actual graves of former president Ronald- and First Lady Nancy Reagan. Limo clients recently had a blast visiting the museum for a unique exhibition on Gengis Khan! The state’s 9th mission erected by the Spaniards, Mission San Buenaventura was founded in 1782. Situated in the heart of Ventura’s downtown, this mission brags some of the most well-preserved and rare artifacts from Californian history. Statues, architecture, a blooming courtyard and living history are found at the mission. As a Ventura County transportation provider for nearly twenty years, few know the county better than us. From our offices on Dean Dr., in Simi Valley and our main headquarters in Thousand Oaks, we serve all cities in Southern California. Toronto limo is large luxurious often chauffeur-driven sedan that usually has a glass partition separating the driver's seat from the passenger compartment. 2 : a large vehicle for transporting passengers to and from an airport. Titanium Party Bus is the best option for wedding, prom, corporate and many other parties.